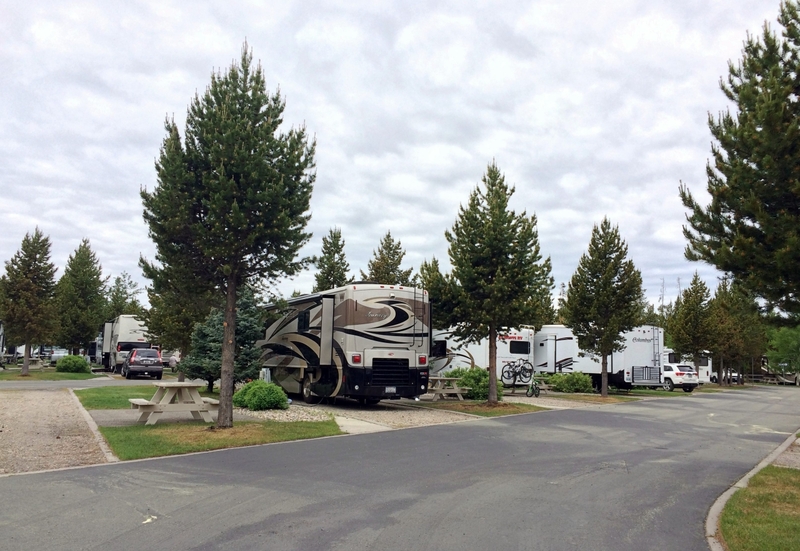 Yellowstone Grizzly RV Park sits just outside the west entrance of Yellowstone National Park in the charming town of West Yellowstone. 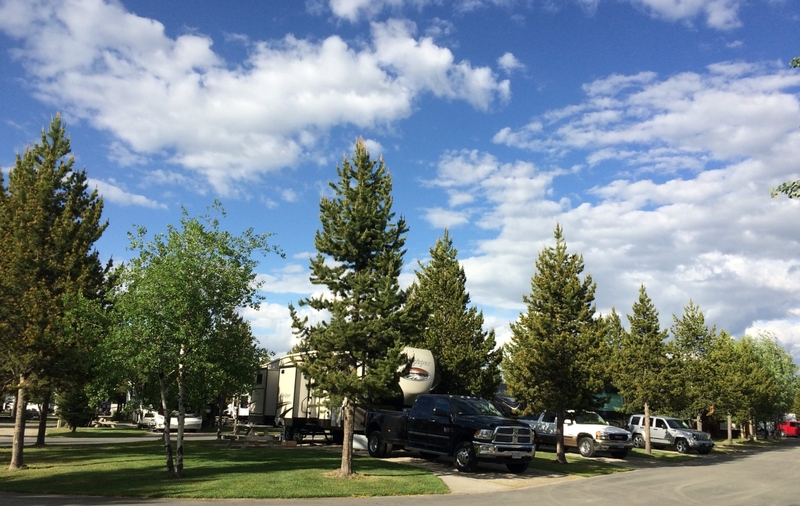 Its convenient location and tidy, friendly atmosphere make it a perfect basecamp for your Yellowstone adventures. As I mentioned in my post about planning a trip to Yellowstone, selecting a basecamp for your stay is a very, very important decision. Yellowstone is a huge park, and you want a campground that will allow you to spend more time in the park and less time on the road. However, if you are like us, you also might want a location that offers access to WiFi, restaurants, and grocery stores. 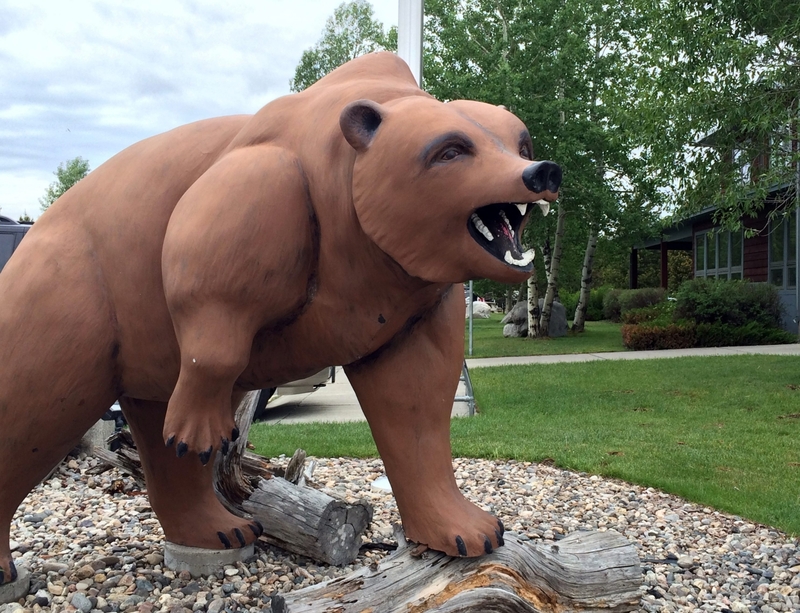 Of the many choices, Yellowstone Grizzly RV Park seemed to check the most boxes on our list of wants and needs. 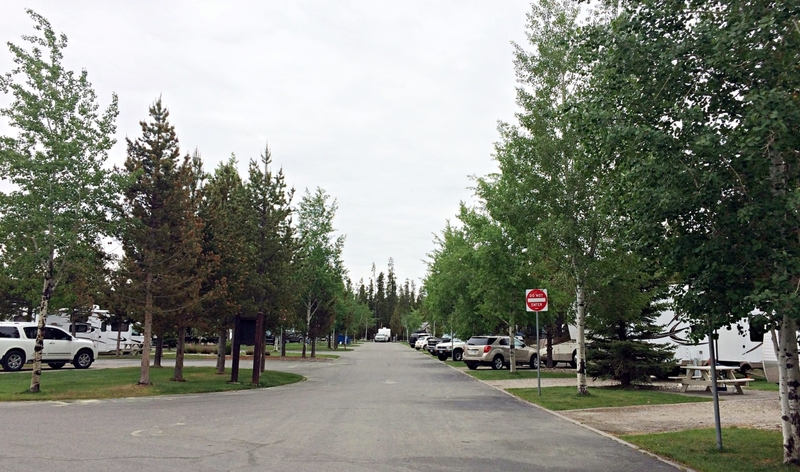 This campground is tidy with a capital T. Though a lot of sites are packed into the park, they are nicely laid out along nice, wide roads. The grounds are meticulously maintained, which adds to the orderly feeling. Even though there are 300 campsites in the park, it didn’t feel busy or crowded. There is a mix of back-in and pull-through sites, ranging from 45-80 feet. The biggest big rigs will have no problem getting situated in this park. All of the sites include full hookups. Though most of the sites are gravel, they seemed level and well-maintained. This park is bordered on two sides by the Gallatin National Forest, and the back-in sites along the forest are the best, in my opinion. The only problem is that these are some of the shorter sites, meaning not all trailers will fit. We were very pleased because we could set our camp chairs behind our trailer and look out into the forest. People with pets will also enjoy this feature since the grass bordering the forest is designated as a pet walk. Even the sites that don’t border the forest have decent-sized trees and patches of grass, giving each one a little space between neighbors. Some of the sites on the north side of the park have less desirable views, with an outdoor climbing center rising overhead. The trees are also younger in this section and provide less shade and privacy. Our only problem with our campsite was that the sewer drain was situated more toward the front of the site, and our hose wouldn’t reach it if we fully backed in. We had to park our trailer more toward the middle of the spot, which didn’t leave much room for our tow vehicle to park in front. If you plan to stay here, you might want to have a good extension hose. In addition to the RV sites, this park also offers a tent camping area and a few small cabins. The tent area would not be appealing to folks wanting a natural experience since it’s located right by the main building and is more of a group campsite. However, the cabins looked almost new and very cozy. In addition to offering great RV sites, Yellowstone Grizzly also has some great amenities to make your stay more fun and comfortable. Playground: The playground has a good jungle gym and a tire swing (you don’t see these often, so it was often full of giggling, spinning kids). The playground also has lots of grass, giving kids plenty of room to run around. Group Pavilion: Near the playground, visitors will find an amazing group pavilion, the nicest I’ve seen. This looked like a great place to hang out and relax while the kids played nearby. Paved Streets: One thing that is not an official amenity that I must mention is the paved streets. We saw lots of kids riding bikes and scooters around this campground. Since the RV park is huge, it offers miles and miles of perfect pavement for peddling. Pet Walk: As I mentioned earlier, a pet walk runs along the forest land at the edge of the park. Families could also enjoy walking this trail, but be cognizant of the fact that you are walking along the back edge of people’s sites. They may not quite expect you to be there. 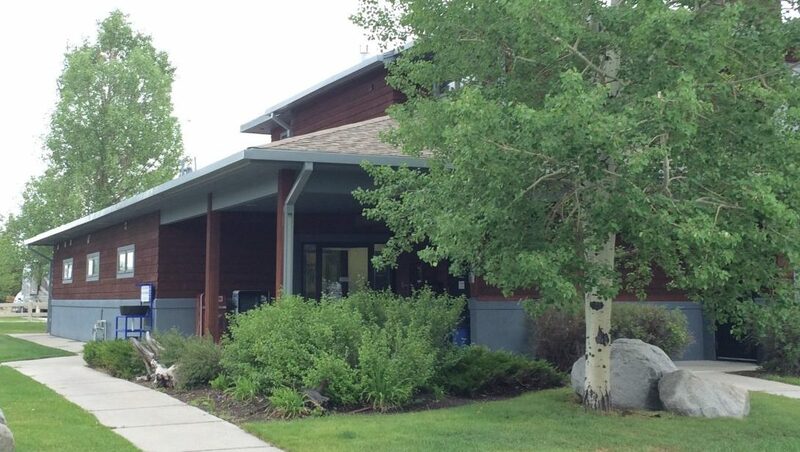 Necessities: Throughout the campground, visitors will find several shower houses, restrooms, and laundry rooms. These were all very clean and well-maintained. Even though there are four laundry rooms, we had trouble finding one with open machines on the day we wanted to do laundry, so we went to a laundromat in town instead. I’m not sure if this is a regular occurrence or if it was just laundry day for everyone else. Hospitality: Inside the camp store, visitors will find two awesome amenities: a friendly staff and free coffee and cappuccino. The front desk folks were super nice and eager to help get us situation in West Yellowstone. Everyone we interacted with seemed like they enjoyed their job. Most were work campers from other states, which were listed on their name badges—a nice touch I haven’t seen elsewhere, except Fort Wilderness. While inside, you can grab a free coffee or cappuccino in the morning. This isn’t a huge perk, but it’s one of those small things that our family enjoyed (yes, even our sons love their java). Camp Store: While inside the main building, check out the camp store. It offers a lot of cute, unique RV-themed decor, knick-knacks, and accessories. 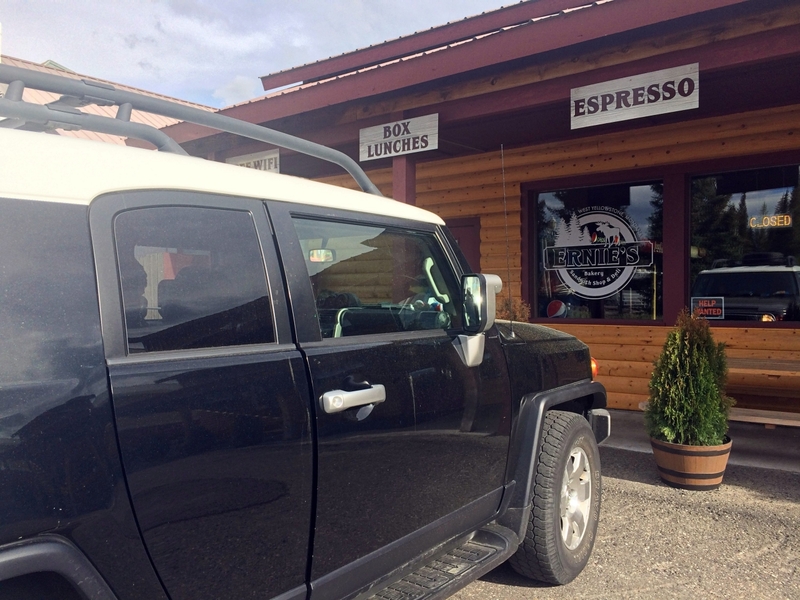 Plus, Yellowstone Grizzly is affiliated with a small gift store in town, where they offer a discount. We bought our fair share of Yellowstone souvenirs here. WiFi: One amenity that was a little hit or miss for us was the WiFi. Visitors get 2 internet passwords per site (while premium sites have 6 codes), and these only worked on computers, not tablets, phones, or iPods. Since our site was at the back of the campground, we didn’t have a strong signal, nor did we have enough codes for everyone. A nice couple I met told us a local bakery offered good WiFi, even after hours, so we made a stop there one evening as we returned from Yellowstone. In addition to good internet access, Ernie’s Bakery serves breakfast, lunch, coffee, and baked goods. You can even grab boxed lunches to take into Yellowstone as you head into the park. 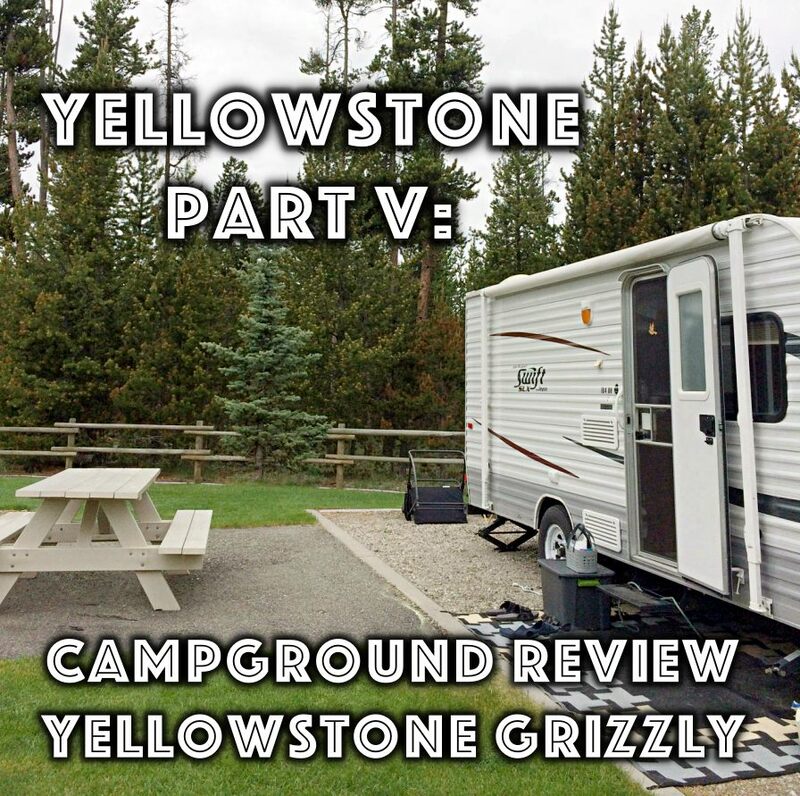 Activities: Since most people use Yellowstone Grizzly as a home base for exploring Yellowstone and the beautiful surrounding region, there are no formal activities offered at the campground. I don’t see a strong need for these since there are plenty of activities to enjoy in the town of West Yellowstone. I’m so glad we made the decision to stay in West Yellowstone. This historic town is packed with charm and everything else you could need for enjoying your stay. 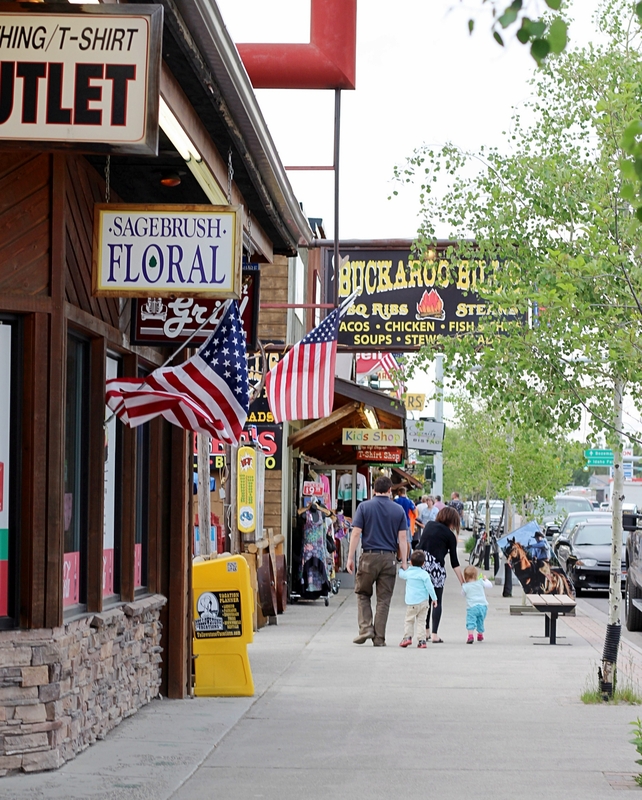 West Yellowstone definitely caters to tourists and offers the traditional variety of gift shops, restaurants, and more. That being said, it has more ambiance than some tourist areas. We enjoyed walking the streets in the evening. 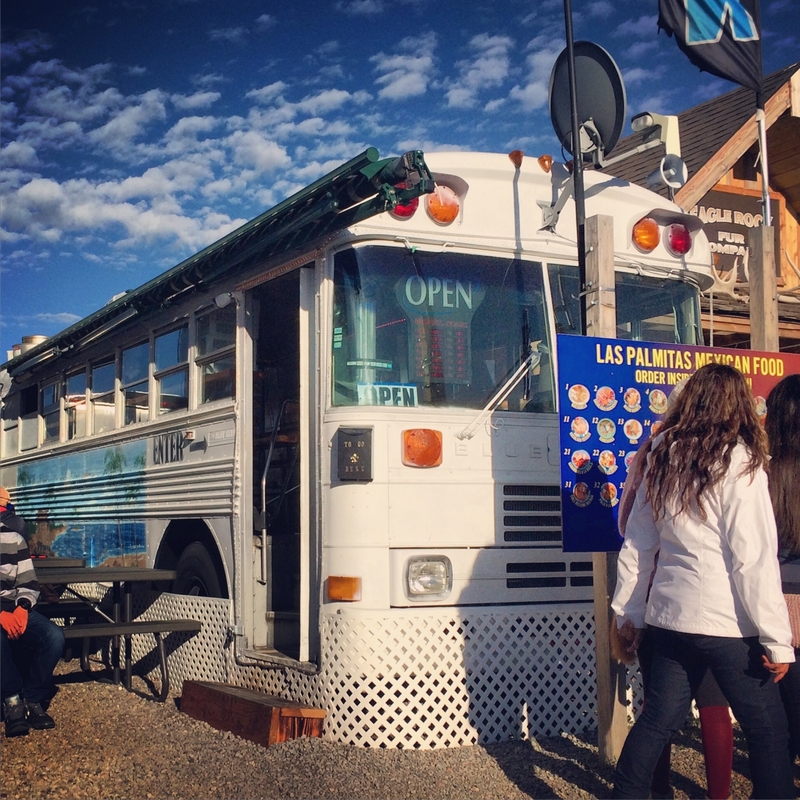 One our our favorite finds in West Yellowstone was Las Palmitas, also known as the Taco Bus. This super fun food joint is found inside a converted school bus. Think more “food truck” than “restaurant” since there’s not actually much seating inside the bus; however, this food truck doesn’t roll. I had the taco plate, and it was so amazing I had to return the next night to eat it again. The food was fresh and flavorful. I enjoyed having a seat on the long bench and watching people out the bus windows as I savored my tasty tacos. You seriously have to check this place out! Delicious and fun. We didn’t eat out every night, unfortunately. 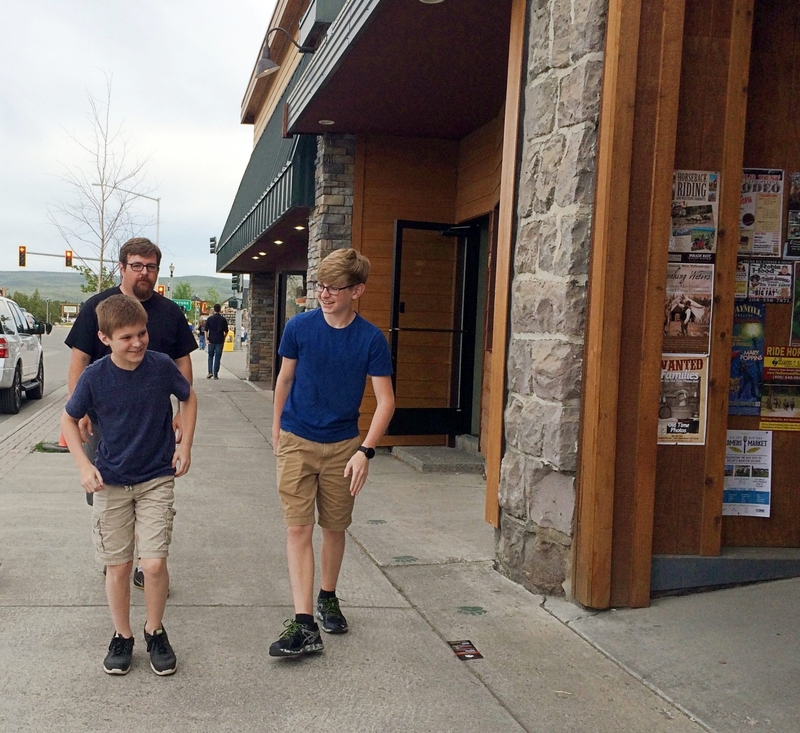 We appreciated that West Yellowstone offers a nice-sized grocery store, so we could restock our pantries. Be sure to pick up some huckleberry jam while in town. You can’t find this just anywhere, making it a special treat. 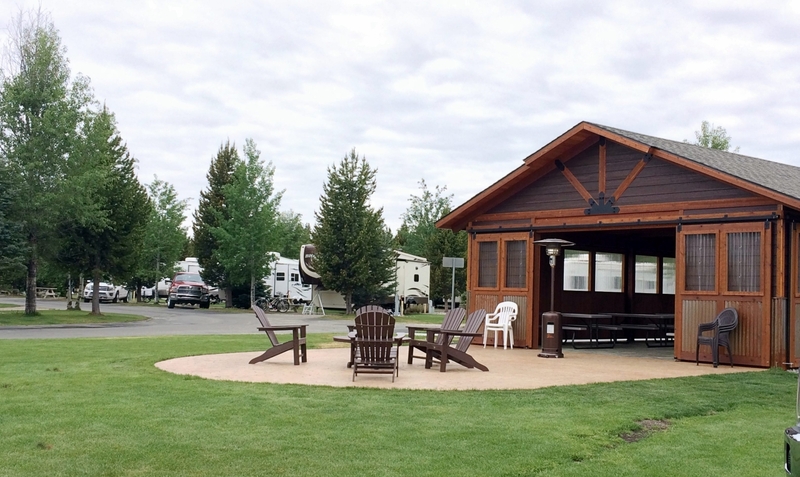 Though the RV park doesn’t offer any formal activities, your family will find plenty to do in West Yellowstone on the days you are not exploring the national park. After wearing ourselves out in Yellowstone, we decided to spend a day resting and catching up on laundry. The National Parks Adventures film was showing at the local IMAX and was a perfect complement to our vacation. One thing we didn’t do that we wished we would have was the Grizzly & Wolf Discovery Center. This highly-rated attraction is a nonprofit rescue center for injured or abandoned animals. It is a great place to learn about the wildlife of the region, while supporting an important cause. One day, we decided to explore a little bit of the area outside of town. We found Hegben Lake and the surrounding mountains to be especially beautiful. As we drove, we truly felt that Montana spirit. Visitors can enjoy these activities and plenty more while in West Yellowstone. My guys definitely did! Description: Large, private park with well-maintained sites. Rates: $68-$80 plus tax. Back-in sites near the national forest have the most scenery, but offer shorter sites. A Good Sam discount is available. Bathhouse: Several located throughout the park. Very clean. 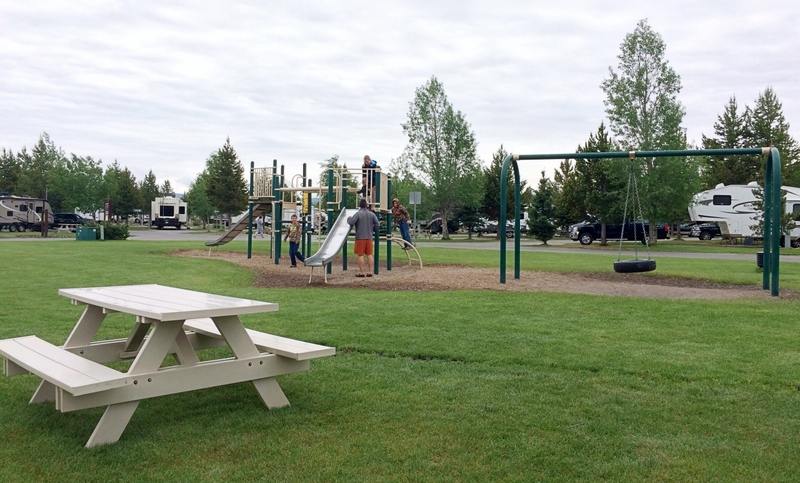 Amenities/Activities: You’ll only find a playground in the RV park, but you can also walk the forest lands or let your kids peddle the pavement. Then, head into Yellowstone or West Yellowstone for your real entertainment. 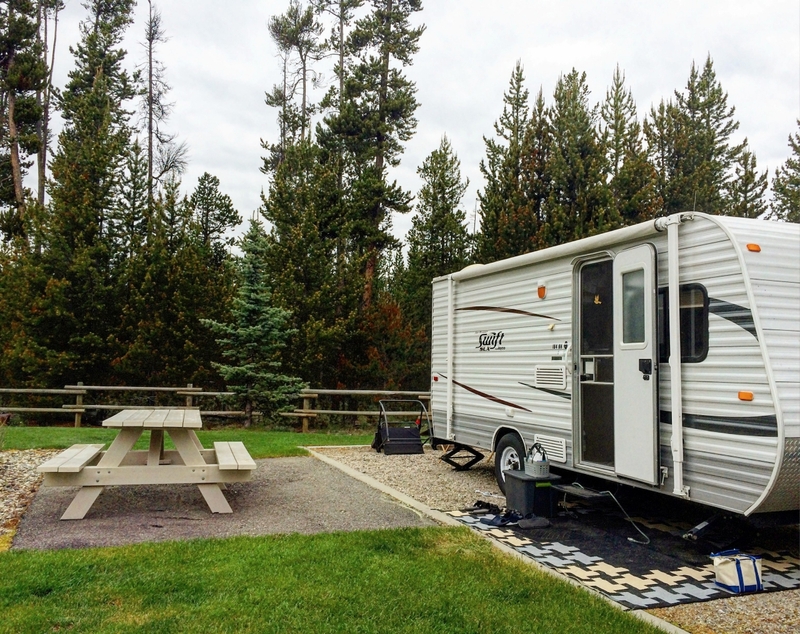 Bottom line: This orderly park is conveniently located near Yellowstone’s west gate in the quaint town of West Yellowstone, making it a perfect base camp for your national park journey. Posted in: Campground Reviews. 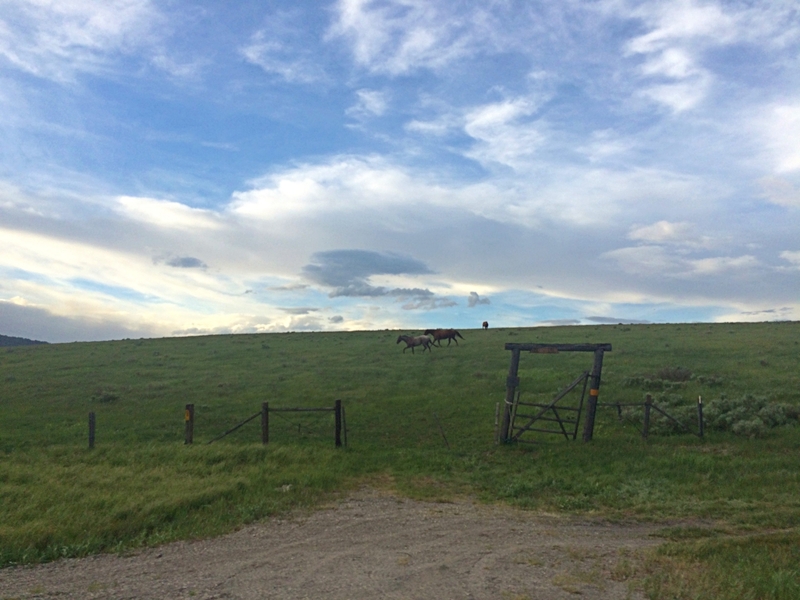 Tags: BirdyNPS100, Campground review, National parks, Private campground, Wyoming. Wow! It looks like a really nice campground! Pinning this so I don’t forget about this spot! It really is a terrific campground. Immaculately clean and very convenient to the park. 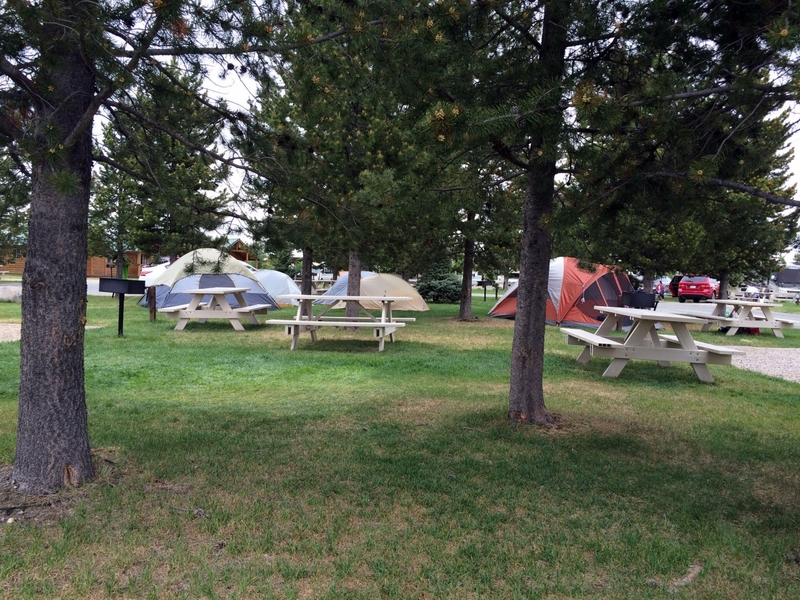 West Yellowstone is a great basecamp!